Wednesday 25th May 2016 at 7.30pm – Licensing Service for our new Team Vicar, Rev. John Jukes at St Leonard’s Church, Malinslee, with refreshments afterwards. Sun, 6 March, 9.15am: Mothering Sunday. Baptism. Sun, 13 March, 9.15am: 5th Sun in Lent. Communion. Sun, 27 March, 9.15am: Easter Day: United Service at St John’s. services and everyone is welcome to stay and chat. There is a toilet with facilities for disabled and for baby changing. New Team Vicar for St John’s Church! This announcement was made Across Central Telford Parish on Sunday 6th December 2015 … We are pleased to announce that Rev John Jukes has accepted the post of Team Vicar with responsibility for St Johns and St Leonards in the Central Telford Parish. John is currently serving as a Curate in the Saltash Team Ministry in Truro Diocese and is married with five grown up children. We anticipate that he and his wife, Denise, will be moving to Telford after Easter with his Licencing at St Leonards following that in due course. We are very excited about this appointment and would like to thank everyone for their prayers and help throughout the recent months and interviews. Please continue to pray for St Johns and St Leonards in the coming months and especially pray for John, that he will know God’s help, guidance and inspiration in the long and fruitful ministry ahead that he has among us. Christmas Fair – this Saturday 21st November, 12 – 3pm! Hi everyone,. 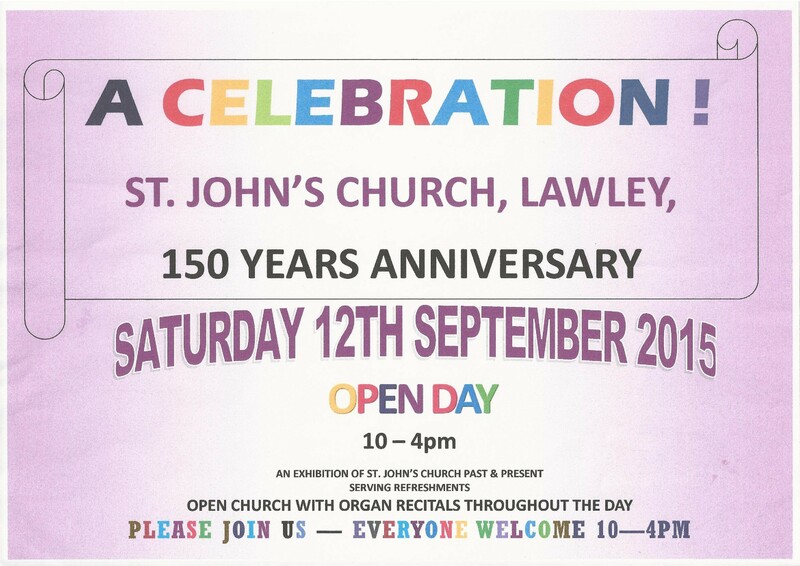 on the weekend of September 12th and 13th, St Johns in Lawley will be 150 years old. We’ve arranged on the Saturday – 12th – a special open church event. There will be a flower festival, organ recitals, a chance to see inside St Johns, while our church hall will be open with displays from the many groups who use the church, some information about the church’s history, as well as cream teas being served during the day. Do pop in for a visit – perhaps you used to live in the area, perhaps you are thinking of having a child christened or considering St Johns as a possible venue for a wedding… this day – Saturday 12th – is a great day to pop by! A member of our church who has been professionally trained – Esther Harris – who offers support in bereavement, depression, anxiety or stress… You are welcome contact her at Little Steps Counselling. We have wanted to refurbish our church hall for sometime. After a successful grant application we have been able to complete the work. Our church hall refurbishment began last week, and it is estimated the work will continue until the end of the year if not til the end of January. We thank God for his provision of the money to do this work. More about the Alpha Course? Jesus? Who was he? Why did he come? Web strategy advice from 3 Sheep.